Don't wait to get cost saving and care improving insights. Nimble technology and clinical expertise enabled Virginia Premier Health Plan to quickly implement opioid rules, improve care and their bottom line. Virginia Premier Health Plan (VPHP), a managed care organization owned by the Virginia Commonwealth University Medical Center, serves 200,000 vulnerable population members in Virginia by delivering quality driven, culturally sensitive, and financially viable healthcare. When the State of Virginia prioritized the problem of opioid addiction, VPHP needed a partner with the infrastructure, resources, and flexibility to meet new requirements and provide data to proactively address the epidemic. Expansion of formularies to include non-opioid pain relievers without prior authorization requirements for all members. These include lidocaine patches, capsaicin gel, gabapentin, SNRIs including duloxetine, pregabalin (Lyrica®) with step edits, NSAIDs including oral and topical, baclofen, and tricyclic antidepressants (TCAs). Additionally, Buprenorphine (Butrans®) patches and/or buprenorphine (Belbuca™) buccal film needed to be added to formularies as an alternative to long-acting opioids for select patients and will require prior authorization. Coverage for naloxone injection and nasal spray without prior authorization. Opioid quantity limits and uniform prior authorization requirements for short-acting opioids less than 7 days per fill or greater than 7 days within a 60-day time period (2nd fill) or less than 90 MME/day for new prescriptions only (less than 28 days of opioid therapy within the last 60 days). Implementation of hard edits or denials for short-acting opioids in excess of 7-day quantity limits, cumulative MME greater than 120. Also, hard edits or denials for concomitant use of benzodiazepine and opioid medications for new prescriptions only. Uniform prior authorization forms for all members on existing opioid therapies and new starts of short-acting opioids prescribed for greater than two 14-day supplies for 60 days. This uniform criteria includes several requirements for short-acting opioids and long-acting opioids, including documenting trial and failure of non-opioid pain relievers, calculation of MME, starting opioids at the lowest effective dose and other requirements. This legislative change was an important initiative for the State to help address the opioid addiction problem, which it labeled a public health emergency. In addition to citing more than 1,000 fatal overdoses in Virginia in 2015 and an increase of 35% in 2016, the state’s opioid epidemic also includes an increase in the number of children exposed to drugs in utero by 21%, resulting in more cases of neonatal abstinence syndrome (NAS). Due to the complexity and immediate nature of the regulations, VPHP needed the support of a pharmacy partner that could be flexible and nimble, and help them meet these new and varying requirements with a very quick turnaround for implementation. Upon announcement of the State of Virginia’s emergency regulation regarding changes to opioid medications, several other health plans requested additional time to implement the changes. Although the changes were detailed and required a great deal of programming changes to the adjudication software, Envision was able to complete the changes for VPHP within a 30-day time period—even faster than the State’s own pharmacy benefit administrator (PBA). Because Envision owns all of the pieces of the pharmacy care experience, including LakerSoftware, an adjudication software platform, we can be more flexible and responsive than any other PBM. As a result of the quick turnaround, VPHP was able to implement the new opioid dispensing rules and prior authorization edits, reducing the total cost of opioids 15% and overall opioid utilization among its population—an 18% decrease in the number of prescriptions filled and a 19% decrease in overall quantity of pills dispensed. This represents a savings of nearly $370,000 over the same six month time period during the prior year. This wasn't the only way VPHP realized savings. 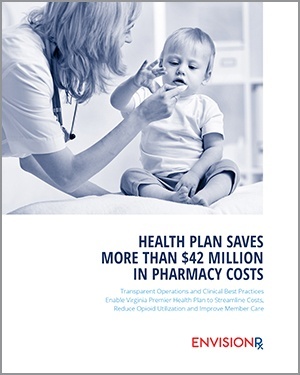 See how this health plan saved $42 million in pharmacy costs. Download the full case study to see how VPHP improved member care and saved money at the same time.